The DSR-1600 is the successor model to the DSR-60. Implementing the innovative, high standard technology featured in the DSR-2000, the DSR-1600 boasts improved jog audio, slow motion and editing performance. Two major features of these models are the built-in jog/search dial and its multiple format playback capability of DV (SP only) and DVCPRO 25. 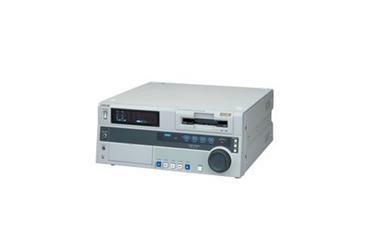 This unit has the ability to automatically accommodate all 25 Mbps cassette sizes, and do not require a cassette adapter or menu setting changes for playback of these formats. The unit also has a full range of both analog and digital interfaces. The availability of the SDI interface ensures a migration path to Digital Betacam, Betacam SX and SDI-based systems. The SDTI (QSDI) interface enable a quality deterioration-free transfer between the DSR-1600 and DV compression-based systems. One new option for this line is the i. LINK IEEE-1394 DV I/O connection capability, which is useful for transferring digital video from the DSR-1600 to DV I/O equipped VTRs and nonlinear editing systems.